What Does a Shutdown Mean for the Washington Region’s Economy? 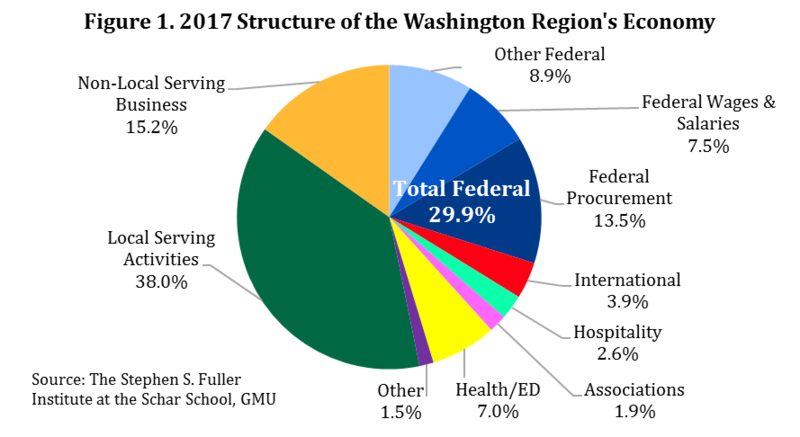 As shown in Figure 1, the federal government accounts for 29.9% of the Washington region’s economy as measured by gross regional product (GRP). 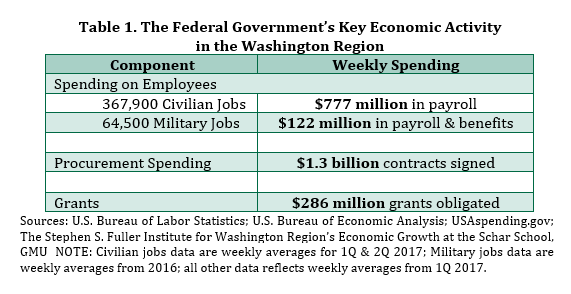 The largest component is procurement (13.5% of GRP) and the federal government purchased nearly $78 billion in goods and services produced in the Washington region in FY 2017. Federal wages and salaries account for 7.5 percent of the region’s economy, including $41 billion in civilian wages and salaries and about $6 billion in military salaries and benefits. All other federal spending, including transfers and grants, generates 8.9 percent of the Washington region’s economy. Table 1 shows the major components of federal payments in the Washington region which contribute to this GRP effect. Direct federal employment is the most visible component. The Washington region has 367,900 federal civilian employees. Each week, civilian employees working in the Washington region earned $777 million in wages and salaries in the first and second quarters of 2017, 17.4 percent of all civilian wages earned in the region. In addition to these civilian jobs, 64,500 members of the military worked in the region in 2016. Each week, an additional $122 million in payroll and benefits was disbursed to these workers. Federal procurement is the largest component of GRP in the Washington region and has exceeded payroll since 1996. In FY 2017, the federal government procured $78 billion in goods and services in the region and an average of $1.3 billion worth of contracts were signed during the first quarter of 2017. While the timing of the disbursements varies by contract, we can reasonably assume that weekly payments were of the same order of magnitude. Similarly, $286 million in grants were committed each week to organizations for work in the Washington region during the first quarter of 2017. This amount excludes many payments that are structured as transfers, especially those to state and local governments. Altogether, the federal government spends approximately $2.5 billion in the Washington region each week. Disrupting the flow of payments, even temporarily, would affect the 29.9 percent of regional economy that relies on these payments, impacting households and businesses alike. A short shutdown, especially one with retroactive employee pay, will most likely have a larger psychological impact than an economic one. Much of the lost spending and economic activity is made up post-shutdown. However, the disruption to the economy would have economic costs as a result of lost efficiency. Additionally, the timing and location of the activity will shift, disproportionately affecting some households and businesses. The increased uncertainty will also affect consumer and business confidence, most clearly illustrated through the weakening housing market after the 16-day shutdown of 2013. Many, but not all, civilian federal employees are furloughed during a shutdown, resulting in the loss of both productivity and compensation. During the 2013 shutdown, a peak of 850,000 civilian employees were furloughed nationally, about 31 percent of all civilian federal employees. Assuming that a similar percentage was furloughed in the Washington region during a “typical” shutdown, about 114,000 civilian employees would forego about $241 million in wages and salary per week. The effects of a shutdown on the members of the military is less clear. During the 2013 shutdown, a bill was passed prior to the shutdown to ensure that the military was paid. Even if employees receive back pay after the shutdown ends, some households will have difficulty going without a paycheck during even a short shutdown. These households, which are more likely to be low income, may incur late fees or other costs as a result of the disruption to their household budget, further burdening these households and adding to the total economic cost of the shutdown. During the shutdown, contractors and grantees may not receive payments. For most contractors and grantees, the funding has already been obligated and payments are disbursed after the shutdown ends. However, some hourly contractor workers, like janitorial staff or cafeteria workers in federal buildings, may lose the hours and corresponding payments. The shutdown will slow economic activity because it will disrupt the flow of a portion of the $2.5 billion that should be disbursed. If employees are paid retroactively and back payments are made on contracts and grants, much of this lost economic activity will be made up post-shutdown. That is, the timing and the location of the spending shifts but the total dollar amount is similar. For example, federal employees may not frequent the corner deli in downtown D.C. during the shutdown but instead go to dinner closer to home sometime after the shutdown. Despite the modest economic impact of a short shutdown, it is a signal that our main industry, the federal government, isn’t working normally. This uncertainty makes households and businesses more cautious. For example, existing home sales decreased in November 2014 compared to November 2013 (Figure 2). This was the first monthly over-the-year decrease in nearly two years and is likely the result of potential homebuyers re-evaluating their options as the result of the shutdown. 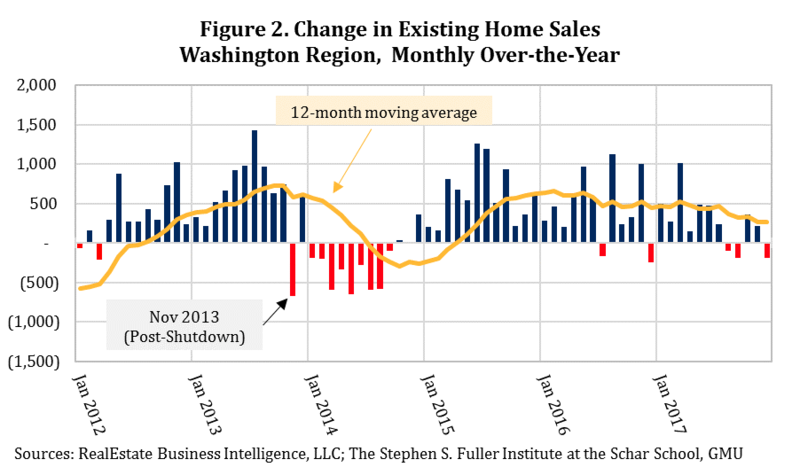 Home sales continued to decline for most of 2014, reflecting the regional economy’s weakness during Sequestration. The 2018 shutdown may have a larger impact on the home sales market than it did in 2013. The existing home sales market was improving in 2013 prior to the shutdown. In 2017, home sales in 2017 were uneven, with monthly over-the year declines occurring during August, September and December. Compounded by the changes to the mortgage interest deduction and state and local tax exemption and rising interest rates, the 2018 housing market had a weaker foundation compared to 2013, even pre-shutdown. Because of this, the effects of the shutdown may be delayed; potential homebuyers and sellers may accelerate their timeframes under the assumption that the upcoming market will continue to be unsettled and attempting to minimize future uncertainty by acting sooner. Overall, a short shutdown with retroactive pay to federal employees will have a modest net economic impact. The shutdown will disproportionately affect some households and businesses, and increase the risk in the regional markets, especially the housing market. A long shutdown would be far more disruptive, especially one without back pay. The severity of the economic impact would depend on the length of the shutdown and what percentage of the government was running. Even given today’s uncertain political climate, a shutdown of this length and severity is highly unlikely, especially with the State of the Union eight days away. Assuming that 31 percent of both military and civilian employees are furloughed without back pay, the region would lose $278 million in payroll and benefits to the military each week. Assuming that even 10 percent of the contracting and granting activity was forgone and not spent post-shutdown, the region would lose an additional $159 million during every week of the shutdown. A three-week shutdown would result in $1.3 billion in lost spending, the equivalent of 0.26 percent of the region’s GRP. For comparison, the current forecast for GRP growth in 2018 is 2.3 percent. In addition to the direct GRP effect, the distributional effects and diminished consumer and business confidence would intensify. Furloughed federal workers, federal contractors and other businesses reliant upon federal customers would need to have savings or other sources of income to absorb the lost revenue. In the short-term, these businesses and households would decrease discretionary spending, which would have a secondary effect on the region’s restaurants and retailers. In the long-term, households and businesses may seek to cut essential spending to the extent possible. This may include renting instead of buying, for households, and moving either within the region or to another area for both households and businesses. Although the Washington region is progressing in diversifying its economy, it remains a company town and when its main company ceases to function, the effects can be far-reaching. A shutdown of any duration injects increased uncertainty into the regional markets and disrupts the usual flow of productivity and payments. On net, the regional economy can recover from a short shutdown with retroactive payments. However, individual businesses and households will be affected differently, with some taking longer to recover. A lengthy shutdown or one without retroactive payments will have a more significant negative impact on the region’s economy: a three-week shutdown would decrease GRP by an estimated 0.26 percent and each ensuing week would add nearly 0.1 percent to the loss. Civilian jobs data are from the U.S. Bureau of Labor Statistics, the Current Employment Survey. Civilian payroll is from the U.S. Bureau of Labor Statistics, Quarterly Census of Employment and Wages. Military employment and wages and benefits are from the U.S. Bureau of Economic Analysis. Grants and procurement are from the USAspending.gov. Housing sales data are from RealEstate Business Intelligence, LLC. All data are as of January 21, 2018.